I'm getting closer to reading Dr. Zhivago by Boris Pasternak. I kind of have a mental as well as written list of books I want to read and since I am doing the A to Z challenge by author, two books away from the P's. If I decided to do it by title, I'd never get to it. I've already read Tolstoy's War and Peace and Anna Karenina. I don't know what it is I find so fascinating about Russian Literature. Maybe it is the time period, the characters or just the writing. Pasternak himself has an interesting history. He was born in 1890 in Moscow and studied philosophy at Moscow University. He worked in a chemical factory during world war one and then ended up working for the soviet commissariat of education after the revolution. His first book of poetry was published in 1913. He had to turn to translating European writers works for 10 years from 1933 to 1943 because his political viewpoint was opposed by the soviets and didn't meet the communist party line. During this time, he wrote Dr. Zhivago, but it was rejected by soviet publishers in 1956. His manuscript was smuggled out of the country and published in Italy in 1957. He was awarded the Nobel Prize for literature in 1958 but he was unable to leave the country to accept it. He was forced to decline the prize by his government. The book was on the New York Times best seller list for 26 weeks in 1958 and 1959. One of the reasons I decided to read the book is because of the Take a Chance challenge to read a book from my birth year. I discovered it was on the list. Pasternak died of natural causes in 1960 at the age of 70. The novel was banned in Russia until 1987. Dr. Zhivago is a political social romantic drama about 5 young people during the Russian Revolution spanning from 1901 to 1943. Sounds similar to War and Peace so it will be interesting to compare this one to them. Here's an interesting piece of trivia. Boris's father, Leonid was a Russian Impressionist painter and not only painted portraits of Tolstoy but illustrated War and Peace. 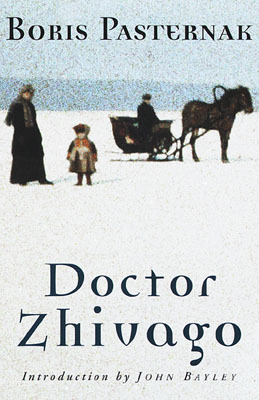 I've wanted to read Dr. Zhivago after learning to play the theme song from the movie as a teenager. Perhaps this will be one of the remaining 25 books that I'll read during the rest of the challenge. There have been so many good books that I've learned about through this challenge and reading other people's reviews! I've read Dr. Zhivago twice. Once when I was a romantic late teen/early 20's girl. Thought it was wonderful. I reread as an adult and it had lost its charm. I think because it seemed to me to be nothing but an overblown story (well written and dramatic!) excusing adultery. Deliberate, uncaring adultery. So, you know what, I personally think there are better 'classics' out there to read. I've gotten rather behind in my reviewing, so this weeks post is three fantasy book reviews--each of five words or less.